CHERNIVTSI, Ukraine -- Onion-domed Orthodox churches. Solemn Catholic cathedrals. Cobblestone streets lined with mansions. A movie theater built on the ashes of a synagogue. 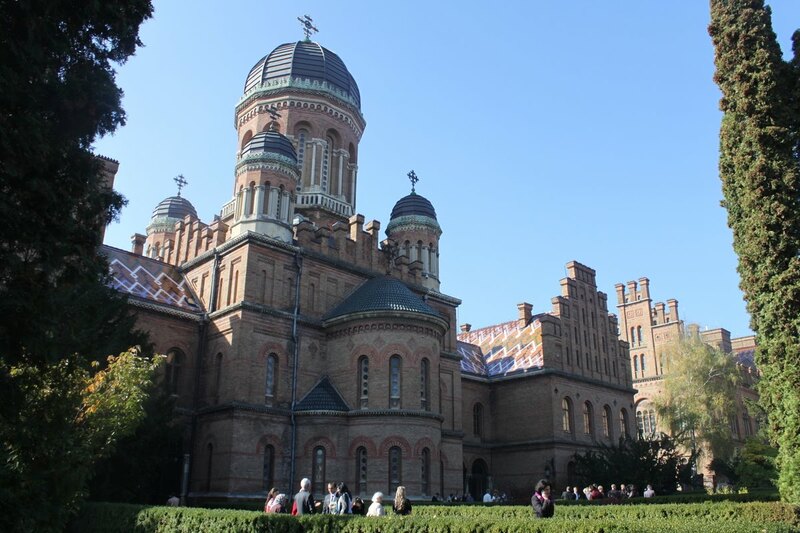 The UNESCO-protected Chernivtsi Universtiy is seen in Chernivtsi, a city of 250,000 in southwestern Ukraine. Known as the Little Paris or, alternatively, the Little Vienna of Ukraine, Chernivtsi is a perfect place for a quiet romantic weekend trip and a crash course in the painful history of Europe in the 20th century. These landmarks stand as testament to the shifting identities of the Ukrainian city of Chernivtsi. As wars raged and empires fell, Chernivtsi reflected the heritage and traditions of its residents and rulers: Austro-Hungarian, Jewish, Romanian, Soviet and Ukrainian. Today, a walk around Chernivtsi is a journey through time, from a statue of a Habsburg emperor, to a deserted Jewish cemetery, to a Soviet tank. But Chernivtsi has many faces. While it offers lessons in the often painful history of 20th century Europe, its elegant prewar architecture and streetscapes have earned it the nickname of the Little Paris or Little Vienna of Ukraine. Streets signs may be hidden by grapevines laden with fruit; wedding processions parade down romantic cobblestone streets, and portraits of Austrian rulers line the walls of a cafe. Chernivtsi was founded as a Slavic fortress on the Prut River in the 12th century. It was part of the medieval principality of Moldavia until being annexed by the Austro-Hungarian empire in the late 18th century. Renamed Czernowitz, it flourished under the Habsburgs and grew from a small provincial town into a bustling, ethnically diverse center of trade, crafts, culture and education. With the fall of the Austro-Hungarian empire in 1918 at the end of World War I, the region became part of Romania. Soviet forces briefly occupied Chernivtsi at the start of World War II, but were soon ousted by Nazi-allied Romanian forces. The Red Army retook it in 1944 and incorporated it into the Ukrainian republic, which is now Ukraine. The jewel of the city is a giant palace-like complex that originally housed Orthodox church leaders. It is now the home of Chernivtsi University and a UNESCO heritage site. Built in the late 19th century by the renowned Czech architect Josef Hlavka, the monumental central building turns into a landmark Orthodox church on one side and a soaring clock tower on the other. On weekdays, the campus is filled with students, but on weekends, it's taken over by tourists walking slowly to appreciate its full magnificence. The university's icon-lined Church of Three Saints is also a popular destination for exchanging vows, while the manicured bushes, lawns and park are perfect for wedding photo shoots, the brides in white and grooms in black, trailed by photographers and droves of friends and family. University Street runs from the school to the Chernivtsi movie theater, which serves as an unlikely reminder of the city's Jewish history. Before the war, Chernivtsi was a vibrant center of Jewish life, home to several dozen synagogues and some 45,000 Jews, or about a third of the city's population. Only a third of the Jewish population survived the Holocaust and the war, and most of them then emigrated to Israel and the United States. Today, Chernivtsi has a total population of 250,000 including little more than 1,000 Jews. Signs of Jewish life are few: two synagogues, a small Jewish history museum, a Hebrew school and a rundown Jewish cemetery, one of the largest in Eastern Europe. The remains of the city's main synagogue, which was partially destroyed during the war, were turned into a cinema by the Soviets. Locals have dubbed the blue building the Cinegogue. Nearby is Theater Square, which was once the site of a food bazaar and was called Elizabethplatz in honor of the Austrian Empress Elizabeth. Now it is home to the highly regarded Chernivtsi Drama Theater, built there at the beginning of the 20th century. Next to the Central Square and city hall is the pedestrian-only Olha Kobylianska street, named for a Ukrainian writer and women's rights activist who celebrated this region in her works. Lined with elegant two- and three-story houses from the turn of the 20th century, the romantic cobblestone street, a popular site for wedding processions, is dotted with benches, trees and outdoor cafes. Popular eateries on Kobylianska include the Videnska Kava (Vienna Cafe) and Koleso (The Wheel). At Videnska Kava, customers slowly sip coffee under solemn portraits of Austrian monarchs and tackle giant servings of delicious cake big enough for two. At Koleso, hearty Ukrainian fare includes banush, traditional porridge made of corn flour boiled in sour cream. Count Vorontsov's Wine Cellar on Shalom Aleichem Street offers both regional and European cuisine. Try to catch an evening organ concert at the 19th century Armenian Church, also built by Hlavka in a mix of Roman, Byzantine and Gothic styles typical of medieval monasteries of this region. Farther down Armenian Street is St. Nicholas Cathedral, nicknamed "the drunken church" because the pillars of its side domes are canted as if falling over. This is one of the few Chernivtsi churches that continued to operate during the Soviet era, which is why its icons, stained glass panels and the relics of Orthodox martyrs are well-preserved. At the central bazaar on Chervonoarmiyska (Red Army) Street, you'll find salo, the salted pork lard that is a hallmark of Ukrainian cuisine. Villagers will be selling eggs, milk "from just under the cow" and freshly skinned poultry, and you might even spot a tired middle-aged woman selling giant mushrooms picked in the woods to subsidize her meager pension. It's yet another side to this city's many identities, and one you're not likely to find in the real Paris or Vienna. If you visit Kiev in winter, cozy cafes are perfect places to save yourself from cold. There is very snowy and frosty weather. Just find a place in a directory of Kiev cafes to have a shelter, warm atmosphere and taste Ukrainian food. But in Ukraine Travel guide you will find much more then cafes. There is everything for comfortable Ukraine tourism including hotels, apartments, bars, pubs, taxis etc.